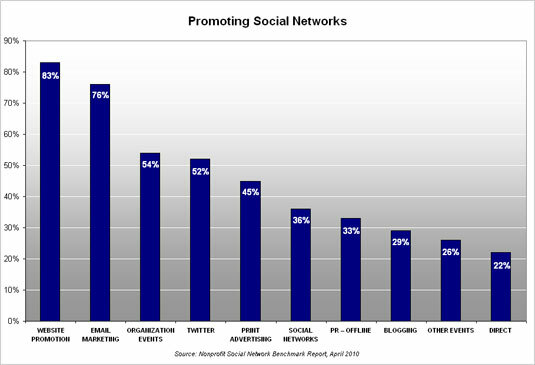 How do Non-Profits Promote their Social Network sites? As you can see by the chart above most non-profit organizations are using their websites and email campaigns (alerts, newsletters, etc. ), with 82.5% (78.7% in 2009) and 75.7 (71.9% in 2009). The next most common tactics were promotion at the organization’s events 54.1% (43.2% in 2009) and Twitter 52.1% (44.0% in 2009). How are you promoting your social network pages?